There are many different types of stickers. They can be used as a promotional marketing tool, packaging purpose, or garment & product branding. CLP produces stickers with quality print on a variety of material with different adhesive and finishes, custom to what you need. See below for available options. 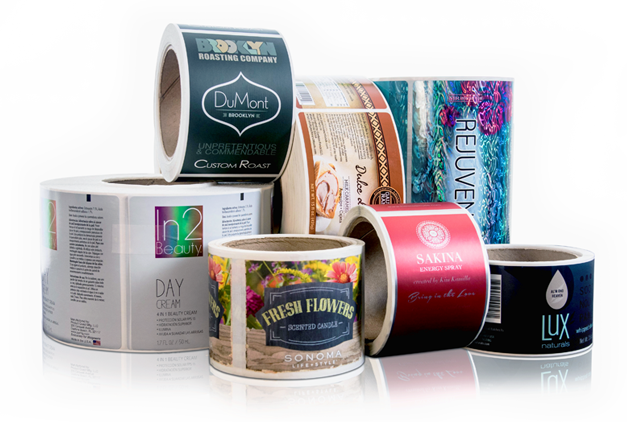 Flexo stickers matches Pantone inks to achieve top quality color and print. Materials can be used to die cut into custom shapes and sizes. Different materials and finishes include removable or permanent adhesive, gloss or matte surface, BOPP (refrigeration safe), and fabric safe adhesive. Inkjet printed stickers is an inexpensive option that is great for smaller runs. The stickers are digitally printed using 4-Color-Process (CMYK), making it a viable option for artwork that is not spot color based, (i.e. gradients, photographs, etc). Custom die shapes and sizes are also available with quick production turnaround times.